Genuine Australian opal inlaid in a handmade sterling silver pendant. The pendant is inlaid with one piece of unique rolling flash multi-color Australian opal. 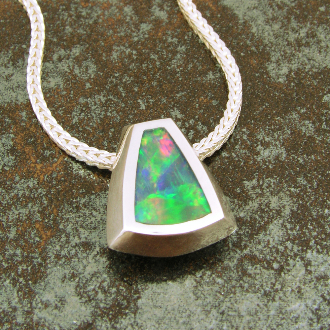 The opal inlay fires strong green, red, yellow and orange as you move the pendant. It is a very unique piece of Australian opal! The pendant measures 12mm wide at the bottom and is 14mm long. Other inlay stones may be substituted for the opal inlay by special order. The bale on the back of the pendant will accommodate most chains or up to a 4mm omega chain. The sterling silver chain in the photo is not included in the price. THE SAMPLE PENDANT IN THE PHOTO HAS SOLD BUT WE CAN MAKE A MATCHING ONE FOR YOU IN 3 to 5 WEEKS.